Welcome and please come in. Feel like the ocean has come to you in the serenity of this room. Bedroom with twin beds. Put them together to form a king bed. TV. Sunny flat backyard to enjoy family games. 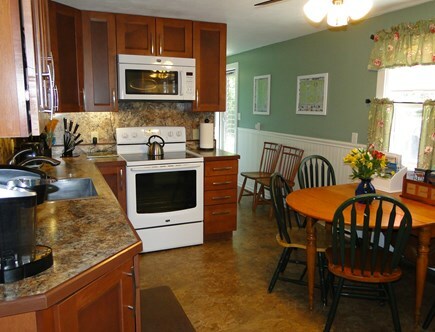 Immaculate,lovely,recently installed central air, 3 bedroom ranch with a private yard. Decorated with comfort in mind. 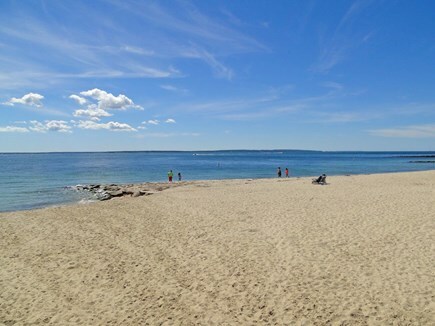 Choose to spend your day at one of many beaches, Bristol, Falmouth Heights, Menauhant that are close or Old Silver that is a short drive away. Located on a quiet dead end street with a saltwater pond (Great Pond) only steps away, you can bring the 2 kayaks provided and glide along the pond. Life vests are also included. Lovingly cared for and nicely appointed, there isn't anything that will leave you wanting in the home. 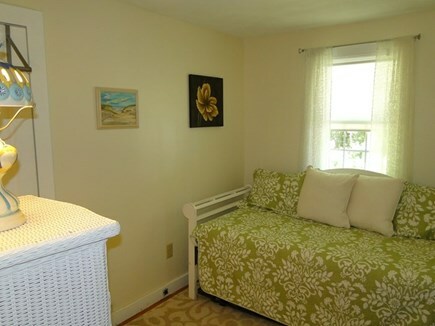 Newly installed central air conditioning will add to the already comfortable environment. There is a half bath in the master bedroom and an enclosed outdoor hot/cold shower to take advantage of when the weather just begs you not to go indoors. 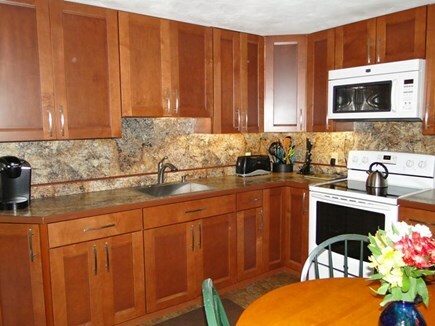 Cable TV, Internet, and washer/dryer are included, as well as linens. 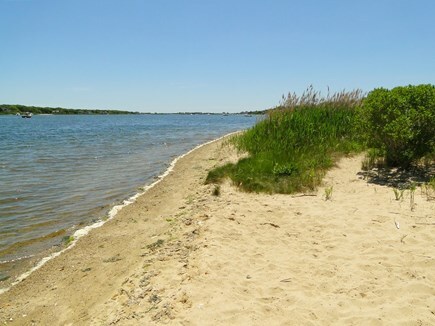 Falmouth Heights Beach is only a little over a mile away, and you could literally walk to shopping, the theater, and bowling, or, if you are feeling adventurous, take one of the 5 bikes that are waiting for you in the shed and check out the Shining Sea Bike Path to Woods Hole. There is also easy access a few streets away to a wonderful biking,walking running path that runs along Great Pond and ends at the ocean. Back at the house you can hone your skills at ping pong, corn hole or shuffleboard available in the basement and horseshoes out in the yard. If you like a good game of baseball go and see the Falmouth Commodores play at their field that is 1.35 miles away. THIS IS TRULY AN AMAZING LOCATION. *Sorry no pets allowed. Owner does have a dog that occasionally visits and stays in the home so if you or someone in your group has allergies to dogs I don't want them to get sick so this wouldn't be the place for your vacation. *No smoking inside the property. *Fireplace is for decoration only. 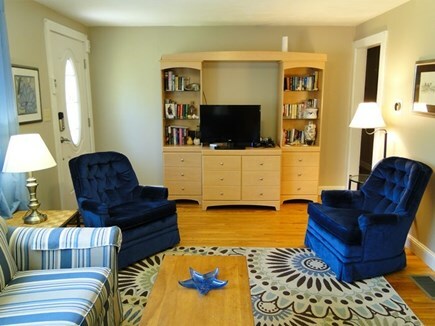 Long-Term Rental (1 month or more): Mid September to May. Winter rental amount is $1300 plus utilities. Tenant responsible for snow removal during winter months. I was fortunate to be able to stay in Elizabeth‘s lovely Cape Cod home from September through the end of January, while I house-hunted. It was immaculate, well stocked with all the basics from linens to paper goods to a washer/dryer in the basement, and located in a very safe and quiet neighborhood. Elizabeth was extremely accommodating; I could not have asked for a better situation, and I would highly recommend her home and her hospitality for anyone wishing to visit the Cape. Nice and friendly, very well equipped. We had a beautiful time in Cape Cod. The house was much more than we expected!! Attntion to every detail for a truly relaxing and enjoyable stay!! 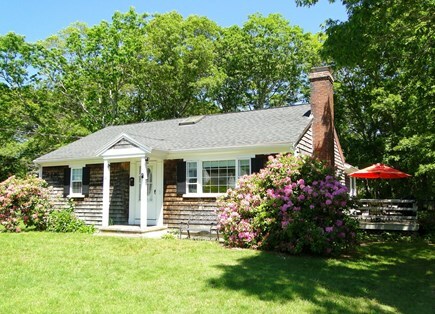 I loved the quaint Cape Cod house, nice location too! We want to come back when we can stay longer! We loved our stay! We went with several teens and everyone enjoyed it. The street ends at the bay, it's just a quick walk to the water with beautiful places to walk or kayak. Beth's house was well equipped and we enjoyed cooking in or eating out. The proximity to shops and restaurants was a plus, also close to local beaches. We look forward to staying there again! We recently spent a week touring Cape Cod and made Falmouth our home base. 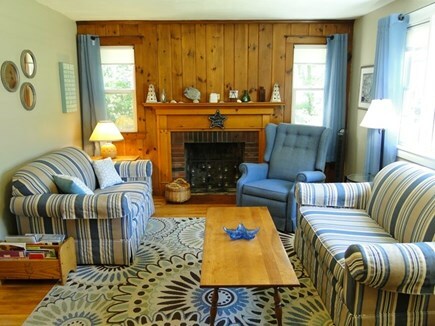 Elizabeth's little cottage was perfect for our family of four (two adults and two teenage boys). The cottage was so thoughtfully stocked with many amenities not found in vacation rentals, and the boys loved spending down time playing ping pong in the basement. The owner even provided kayaks and bikes! 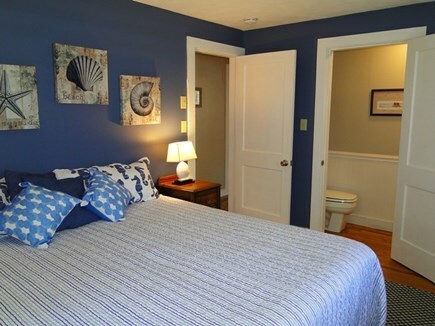 Private, clean, affordable...we highly recommend a stay here. I am so glad you enjoyed your stay at my 3 bedroom ranch home and sorry that you experienced a bedroom that hadn't been dusted. I have addressed that with the cleaner I contracted for the summer and hope that future guests will not have that experience. We had a wonderful 2 week stay. The house was very comfortable with lots of nice touches. Loved the Keurig for morning coffee. Generous supply of linens, soaps and paper items. We loved having the bikes available for riding into downtown Falmouth. A short walk to Great Pond. Our kids enjoyed taking the kayaks out for a bit. A nice walk to the ballpark to watch our son and the Falmouth Commodores play. Loved all the great restaurants in downtown, especially the Pickle Jar for breakfast and Anejo for dinner. The Raw Bar was also a treat. Had everything we needed to cooking in the house and made several visits to the Falmouth Fish market for fresh seafood and lobsters. Nice grill with spare propane for outdoor grilling was a nice touch. 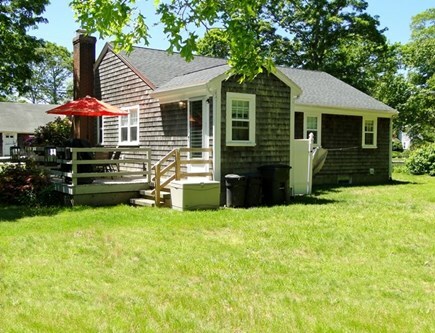 The house is convenient to the main roads and we took some day trip to P-town, Chatham, Woods Hole and Hyannis. Fast ferry close for a visit to the Vineyard. Also took the ferry in Hyannis to Nantucket. This house has been in my family since the 1970's and I recently became the owner. Because I have a full time job, I thought that I would make my home available for rent so that others could enjoy it. 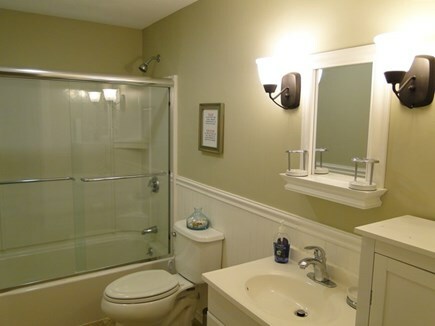 I put my heart and soul into the renovation of this house and did most of the work with my husband. We painted, roofed, refinished the wood floors, enclosed the outside shower and much more as if we were going to be living here ourselves. I wanted people to love it as much as I do and of course when I do get there myself, I love how cozy it is. 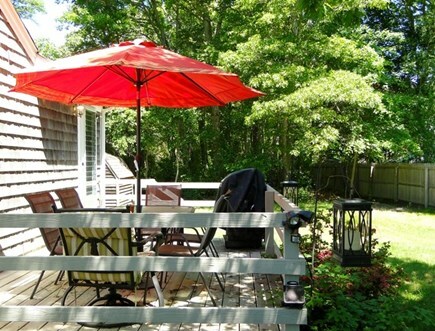 The location is perfect for almost anything you want to do on the Cape. It is so close to shopping, restaurants, beaches, movies and Great Pond at the end of my dead end street is a wonderful place to walk to, either to just enjoy your morning cup of coffee or spend the day in your beach chair reading a book without the hustle and bustle you find at the ocean. Kayaks, bikes, horseshoes, ping pong, and a shuffleboard are also on the property for your enjoyment. There is so much to do in the town of Falmouth. The main street has wonderful shops and restaurants. 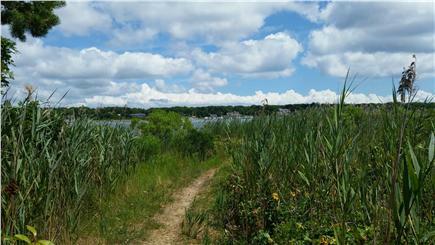 Woods hole is not far away and the Shining Star Bike Path is also a highlight. If you like baseball the Falmouth Commodores a very high caliber of ball plays within a mile from the house. You can make a great family night out of taking in a game or two during your stay.